Wanted to do a quick card for both the TLC challenge – bling it up, and the CAS challenge clearly dramatic embossing over at Splitcoast. 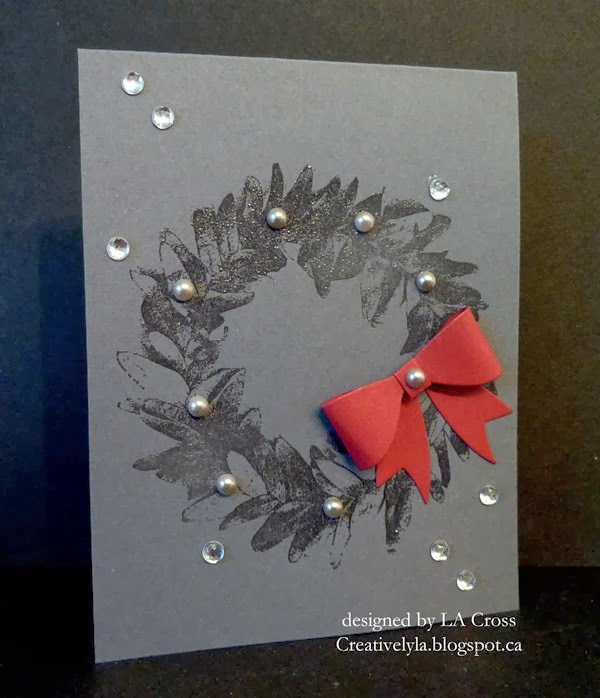 I’ve used a dark charcoal card stock and simply stamped the Stampington & Co. wreath in Versamark and then heat embossed it with clear embossing powder. It does come up more like black but not quite as dark. Then I used the Simon Says Stamp bow die to create my bow and added a whole bunch of bling…both pearls and rhinestones. Quick and easy to do…15 minutes or less.